Every family has a story! Some are more interesting than others. But it is doubtful if any family saga can measure up to the story of Jacob and his offspring. This is true whether we speak of its human interest and drama, or its biblical significance. 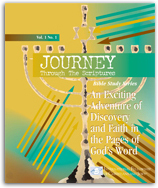 That is why our next two studies in Journey Through the Scriptures will be devoted to studying the origin, history, and importance of the twelve tribes of Israel. Bible students know Israel’s original tribes sprang from Jacob’s sons. The term “children of Israel” to describe the Jews came into use in recognition of the fact that the Jewish nation grew out of Jacob’s children (later renamed “Israel” by God). For a study like this, it helps to familiarize ourselves with the main characters. Jacob was the third of Israel’s great patriarchs (avot in Hebrew), fleeing from his older twin Esau after stealing Esau’s birthright and blessing. Jacob was a “grasper” or “schemer,” but he met his match in his deceptive uncle Laban. As a result, Jacob wound up with two wives – the unwanted Leah, and his beloved Rachel. They, in turn, married their maidservants to Jacob in an attempt to produce more children – and God worked through it all to fulfill His divine plan. Jewish teaching says Jacob was essentially a good person who sometimes resorted to cunning and deceit to get what he felt belonged to him. What lesson did Jacob need to learn most? Why did God lead Jacob from the deception of his father Isaac and Esau straight to the home of his uncle Laban? In Genesis 28:13, God identified Himself to Jacob as "the God of your father Abraham and the God of Isaac." Why did God link His identity with Jacob's ancestors? Was Laban justified in substituting Leah for Rachel at Jacob's wedding? Why did Leah resort to buying a night with Jacob when she was already his wife? In all of our lives we can see human mistakes and misjudgments intermingled with shining examples of God’s love, mercy, and care. Think about your family’s story and your part in it. Is your life a testimony to the goodness of God and an example of living faith in Him? You can be a powerful influence on others when you live for God.